We finally got the news. Thanks to Fabrice’s efficiency and skill in convincing the organizers, we were able to arrange an exclusive interview with Fujishima oyakata, the legendary former ozeki Musoyama, during his stay in Lausanne. The meeting was scheduled for Saturday, August 6th, at 13:00. 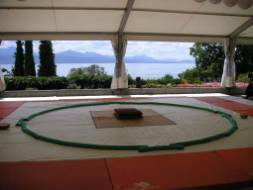 The temporary dohyo of the Olympic Museum... with a view of Leman Lake! From the moment that we first saw the poster of the Olympic Museum announcing the arrival of Fujishima oyakata for a weekend of sumo demonstration as part of a programme connected to a new animation dedicated to ancient sports, Fabrice and I dared to dream of meeting this extraordinary rikishi and having him talk about his passion for sumo. We immediately informed Nicolas, our editor-in-chief, who was enthusiastic about the idea and decided on spur of the moment to come and join us in this adventure. On the terrace of the museum’s restaurant. The briefing: for one last time we reviewed our questions before the interview. For the hundredth time, I checked my tape recorder. Then we met Mrs Chevalley, the chief organizer of the event. This young lady, equally efficient and charming, was about to make our dream come true. At the scheduled time, we knocked at door of Fujishima oyakata, who was accompanied by his pupil Minemura and his tokoyama Tokotake (the hairdresser, whose real name is Nishikawa). 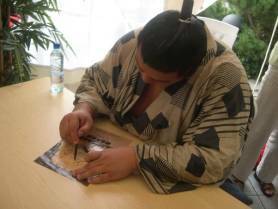 “Please wait a minute, the chon-mage (traditional top-knot worn by the rikishi) is not finished,” could be heard from inside. A few minutes later, we entered the oyakata’s lair - a small conference room turned into a dressing room for the event. We were all amazed by imposing stature of the former ozeki Musoyama, whom we had so often seen in action since the start of our passion for sumo. He stood there, huge and still. Not a single unnecessary gesture would disturb the interview. He was a giant of stone. Power and serenity were the first words to come to mind. Or perhaps spiritual strength? Maybe it was what the Japanese call kanroku. 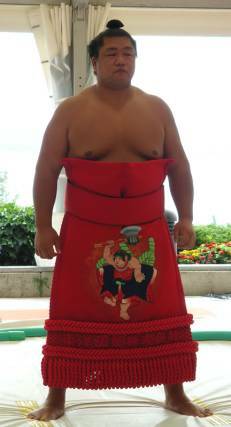 I began to understand why Japanese women are so fond of rikishi! Answers to – sometimes naive – questions of the audience. Fujishima gave his interview with kindness and simplicity. He was very open to questions. Between two questions I could not stop staring at his feet, which were at least twice as large as mine. On them you could see all the pain suffered during training sessions, thousands of tachiai tearing apart the toenails, the biting of salt on open wounds. His feet told his story better than any book could. When the interview was over, Fujishima oyakata was kind enough to pose with us for a couple of snapshots and signed autographs for each of us. Before the arrival of the audience, we met fans from Switzerland and other countries, and we all went together to our VIP places, kindly booked by Mrs Chevalley. She then presented to the audience the new animation of the Olympic museum on the various ancient sports including sumo, before introducing Fujishima oyakata, who would be answering the questions of the audience. Some questions were quite pointed, but most of them were fairly naive, sometimes even slightly ridiculous. “How much does a sumo baby weigh at birth?” asked a lady without turning a hair. Quickly suppressing a glimmer of a smile, Fujishima oyakata answers with a lot of patience that one is not born a sumotori - one becomes a sumotori. The tokoyama does his job. 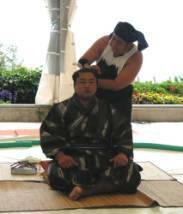 The demonstration of sumo itself started then with the making of the oicho-mage (hair-style that only the sekitori, the salaried wrestlers, are authorized to wear) by master Fujishima’s tokoyama. Yet again, the former ozeki was impressive by his perfect behaviour, and his near monastic stillness. His tokoyama, though as young as he is, is already a master of the art. His steady moves had nothing superfluous and were extraordinarily accurate. He was very serious in his attitude towards the oyakata, Tokotake teased some of the more courageous long-haired men in the audience to dare to abandon themselves to his skilled hands. He gave them the traditional chon-mage. He asked their permission to cut a few millimetres - just to trim the hair - but ended up cutting long locks which he would mischievously return to them once the work was finished. Afterwards, the rapt audience saw a demonstration of how to wear a mawashi, given by Richard Neal, a skilled member of the Swiss sumo team, on new volunteers (all male again, of course), some of whom were quite skinny youngsters. Fujishima oyakata wearing his kesho-mawashi. And then Fujishima oyakata – or rather former ozeki Musoyama – came back in splendour, wearing his red kesho-mawashi featuring ‘Kintaro,’ the child-hero of Japanese tales. His feet rooted to the ground, looking like an age-old oak, he just stood there, letting a lot of fascinated people take their photographs with him, or just to admire him. Seeing a legendary ozeki such as Musoyama up close is very impressive. You feel that he lets you approach him, but also vaguely that you shouldn’t be there - that you are encroaching on his living space. Everyone wanted to take a photograph with the rikishi. The attendance was so huge that it seemed to take a very long time. It lasted even longer because Fujishima oyakata had to take a break to switch his kesho mawashi for a training one. Then the moment everyone was waiting for finally arrived. We were about to see real sumo. Young Minemura, barely 18, was helping his oyakata to give a basic technique demonstration. This was far from the intense drama that you can feel in the Kokugikan, the Tokyo-based home of sumo. Here, everything was done smoothly, though the show was vigorous. Minemura then demonstrated a series of exercises; first the shiko, raising one leg as high as possible and then quickly and strongly stomping it to the ground; matawari, e.g. doing the splits; suri-ashi, e.g. walking quickly on the dohyo whilst keeping as low as possible; and then butsugari-geiko, when the oyakata (or senior rikishi) offers his chest to his pupil’s pushes. Now the children, having put on mawashi, had the honour to fight against Fujishima oyakata in a single combat. The oyakata, with a gruff tenderness, threw away his tiny opponents easily, greatly amusing the audience. The adults then faced Minemura. His mischievous face showed his delight when he made his opponents believe they could beat him. The afternoon ended with an open autograph session. Everyone wanted his autograph, and Fujishima oyakata was willing to satisfy them all. Really, he was incredibly patient. The day ended excellently with a meeting of sumo fans for a Japanese dinner. We had invited Fujishima oyakata, but unfortunately he couldn’t come, as he already had other appointments. That would not harm our joy in sharing our passion for sumo and reliving together those intensely moving moments. Walking decidedly to discover the Swiss wrestling. We arrived at Les Paccots, a small village in the area of Fribourg (in the Alps) where a regional championship of Swiss wrestling was taking place. The sky was grey, the audience were scattered, and there were very few people indeed. On top of this, it was raining. Mrs Nabuko Perroud, the personnel assistant told us, “We’ll be there at 10:00”. We started to have doubts. Would they come? But suddenly a minivan with shaded windows appeared on the road. Was it them? Yes indeed it was. Fujishima oyakata and his entourage got out of the car and made their way to the wrestling area, greeting me with a “Konnichiwa” on the way that made me blush with pleasure. 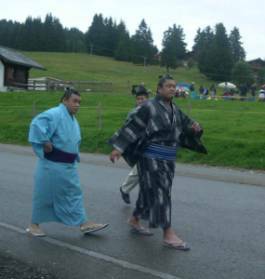 Fujishima and Minemura were dressed in kimonos, barefoot in their zori (a type of Japanese sandals). Tokotake, for his part, was dressed in casual clothes. The speaker officially greeted the presence of the two rikishi, and the spectators, quite amazed, dropped by with an air of innocence to see these visitors from another world and time, whom they would surely not have another opportunity of seeing. One of the organizers came to explain the rules of Swiss wrestling. Fujishima oyakata and his tsukebito listened to him carefully, whilst Tokotake kept snapping away with his digital camera. Unfortunately, the rain really began to pour down, and the ground became soaked. Someone handed Minemura an umbrella to shelter his oyakata. Wind started to blow and it was now freezing. Fujishima oyakata still agreed to answer to a couple of questions from a local reporter, but quickly waved for their departure. The minivan with its shaded windows disappeared into the distance. It was not so bad. We would see him again in a few hours at the museum. Fujishima oyakata, quite surprised, signs a poster for his danpatsu-shiki handed by Nicolas. At the end of the open session of autographs, we presented Fujishima oyakata, Minemura and Tokotake some Lausanne sweets and a few snapshots taken that morning. We thanked him for these two very special days, and we went back home with stars in our eyes, barely realizing how fortunate we had been to come so near to a legend of sumo. Here is a sample of the questions that were asked by the audience to Fujishima oyakata. This is a literal transcript of those questions, the answers having been translated by the interpreter. A: If you want to become a professional rikishi, 15 is the latest. But it is possible to start around ten. Q: What does a retired wrestler do for a living? A: Some remain in the world of sumo. Others run traditional sumo restaurants or get into the business world. Q: When did sumo start? A: More than 1500 years ago. Q: Are there women in the world of sumo? A: They are not admitted in the professional world, but some women are wrestling in amateur clubs. Q: What is the basic meal for a sumo rikishi (to gain strength and weight)? A: It is a meal based on stew and rice to which other ingredients are added. As this is the daily meal of wrestlers, there are a lot of different variations. Q: What is the weight of an average sumotori? A: It generally depends on age and rank, but an average would be about 160 kg for someone who is 185 cm. Q: What were the beginnings of sumo? A: It was barehanded wrestling, used in brawls. This wrestling style then spread amongst the samurai class. Q: Why does someone decide to become a sumotori? A: Because wrestlers are very much admired. Q: How many sumo schools are there? A: There are about 50 heya. Q: Are you obliged to gain weight? A: It’s better to improve one’s stability, but it’s not compulsory. Sumo is also based on strength. 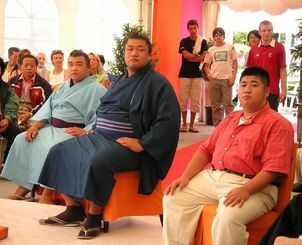 Q: Do you have to belong to a particular social class to enter the world of sumo? A: No, but you have to fulfil some physical criteria. You have to be aged between 15 and 23, be at least 175 cm tall and weigh at least 70 kg. Q: What is the most difficult thing in sumo? A: Simply the life of a wrestler, which is conditioned by the hierarchy. The lower ranked have to wake up early and go to bed late, do all the chores etc. Q: Did any wrestler die during a fight? A: Very long ago, yes - but not nowadays. Q: Why do they throw rice at the beginning? A: It is not rice, it is salt. It is used to purify the surface of the dohyo, as a prayer not to get hurt. Q: Did you lose weight since you retired? A: I lost 20 kg.